Remember that gut-wrenching video, Just One Dog, about the dejected white pitbull with mange and eye infections in California shelter? (The video was made by Cathy at CampCocker.) Well, a bunch of good things have been happening to Stanley since then and he’s doing so much better! He’s now being fostered in a home by the Respect-A-Bull rescue group in Port Alberni on Vancouver Island, British Columbia. His skin and eyes are improving, he has more energy, he’s playing, sleeping in a snuggly bed, and giving out lots of kisses. Here’s the post about his arrival in Canada. 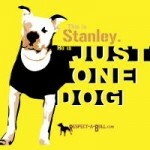 Respect-A-Bull has a blog with information on their other dogs and updates on Stanley. Stanley also has a Facebook page with updates. And check out the video below from a news story. What a sweet boy! Stanley’s story is great, but here’s the thing I think we have to remember—Stanley isn’t special, at all. He really is just one dog out of thousands and thousands of dogs. I think we tell ourselves the fiction that Stanley is special so we won’t feel so bad about the millions of dogs destroyed every year in the US alone. The majority of the dogs destroyed in shelters are no different than Stanley. They just never got a chance. Tons of people have offered to adopt Stanley. I hope so much that they will instead adopt just one other dog. Please support your local rescue groups. 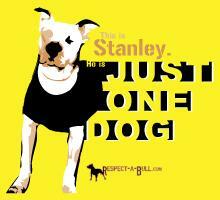 If you want to help out Respect-A-Bull, you can donate on their site or purchase a Stanley shirt. THANK YOU SO MUCH! WHAT A GREAT STORY! He looks so good, what wonderful people out there that look after these dogs in need. God Bless you all. Thank you Cathy at Camp Cocker, God Bless all involved.